Every morning my aunt, Isis, carefully washed the tile flooring in her high-rise apartment in the Vedado neighborhood of Havana. Like most other Cubans I've known, she'd mop the whole floor at least once a day—more often if there was lots of traffic—with the ubiquitous Cuban mop. In the early hours before the heat set in, she'd move all the furniture to one side of the room and then back as she cleaned every square inch of the black composite stone tile, pausing only to rinse and squeeze out the cotton cloth of the mop. Finally, she'd open the doors and wooden window slats to let the breeze dry out the whole place. In the older neighborhoods of Havana, where most houses were built in the colonial era, it's easy to get a glimpse at the interiors of ground-floor homes and private spaces where wooden doors and shutters are frequently left open to help with air circulation in the intense subtropical heat. Multi-colored Cuban hydraulic tile floors peak from doorways and windows like jewels from another century. The US trade embargo of Cuba has resulted in a lack of access to the imported, mass-produced, building materials that overtook the tile industry outside Cuba after 1960. 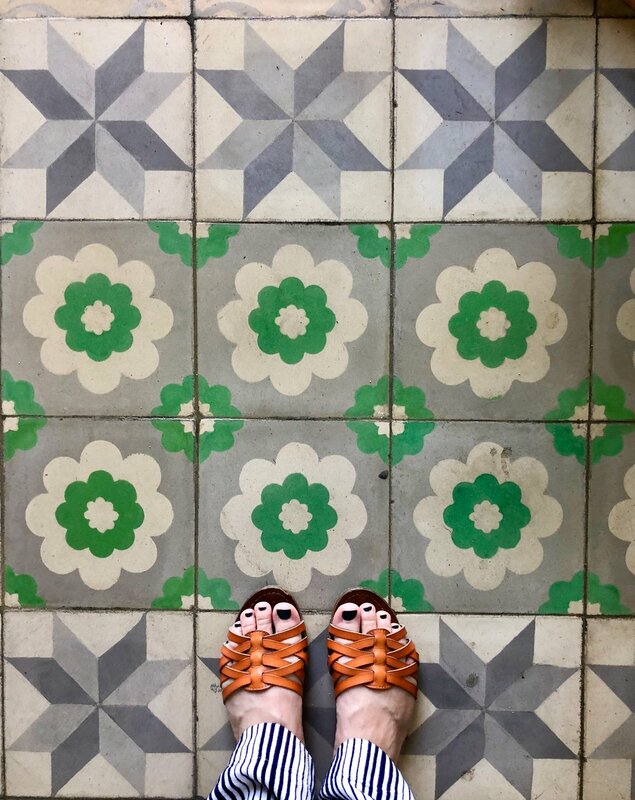 That means most public and private spaces have retained their original, handmade, hydraulic cement tile so popular from the mid-19th to early 20th century. Hydraulic tile was developed in mid-19th century Catalonia, Spain and was simpler than previous tile-making processes. The cement tile is created in a patterned mold with a hydraulic press that hardens the tile and is then air-dried. Older methods that used repeated firing required more time and labor. An important feature of hydraulic tile is the resistance to fading that can occur in glazed tile. Instead, the patterns stay true even as the tile wears down over time because they're created by pouring concrete already mixed with different colored dyes into brass molds. Even as the tile wears down the colors remain vibrant. An important feature of hydraulic tile is the resistance to fading that can occur in glazed tile. Instead, the patterns stay true over time because they're made by pouring concrete already mixed with different colored dyes into brass molds. Even as the tile wears down the colors remain vibrant. Cuba was the second country in the Americas after Mexico to produce hydraulic tile. The first tile companies in the country were established in Havana in the late 19th century and had some early success. Many of their workers were Spanish immigrants who brought important knowledge from Barcelona factories, where hydraulic tile originated, but Cuban businesses struggled to compete with imported tile until a construction boom in the early 1900s increased local demand. A home with elegant European-influenced architecture required an elegant interior, and one way to mimic the ornate pattern of a rug—nearly impossible to maintain in a climate as humid as Cuba’s—was to install a repeating tile pattern with a distinct border and corners. Cat lounging on a traditional tile floor at El Café in Old Havana. For a catalog of Cuban tile designs and more history about hydraulic tile, check out Havana Tile Designs and Barcelona Tile Designs by Mario Arturo Hernández Navarro.